Pioneers of Wabash: 33 guests at the seventy-eighth birthday dinner given by Dr. J. H. DePuy, Aug. 30, 1898, commemorating his natal day. They are: Top Row, left to right, Col. J. H. Bruner, 74; Jack Higgins, 79; Franklin Keyes, 86; David Coble, 82; Judge J. D. Conner, 79; Jesse Talbert, 79; M. W. Ross, 75; J. H. Talmadge, 74; Captain J. M. Thompson 71; John Tyre, 70; Philip Alber, 80. Second Row, left to right, Michael Hyman 81; R. P. Mitten, 65; Leven Murphy, 85; L. P. Bollison, 83; Philip Davis, 79; T. E. Payne, 72; Dr. R. F. Blount, 67; Hon Calvin Cowgill 79; Dr. M. R. Crabill, 81; W. H. DePuy, 70; Cornelius Lumaree, 84. Bottom Row, left to right, Henry Wenzel, 73 John Greer, 70; Levi Bruner, 75; Miles Morgan, 83; John Hoover, 83; Dr. J. H. Ford, 96; Dr. J. H. DePuy, 78; Albert Pawling, 90; Thomas Underdown, 74; J. S. Daugherty, 70; David Bach, 74. 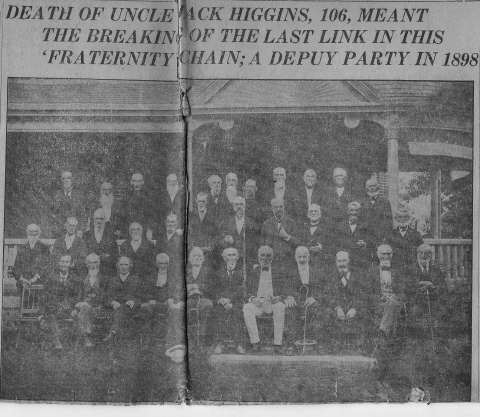 With the death of Jack Higgins, 106, who died in his Thorne street home in Wabash, Feb. 19, 1925, occurred the passing of the last of a group of pioneer citizens and leading men of Wabash, of 25 years ago, who were wont together in those day in festive occasions to reminisce. There were approximately 33 men in the group, of whom the majority were Civil war veterans, and whose lives were filled with adventure and romance. Of these Jack Higgins, then prime, was the liveliest, and only 79 years old, and in his stories most exciting. Though he had nearly reached the four score mark, even then Jack Higgins's wiry body was full of vigor and the spirit of adventure with some of his most interesting experiences in life ahead of him, greatest of which was to live to see the day when he should ride in the air. One of the saddest of these experiences was to watch the passing of each and every one of his "comrades", and to live years after they had gone. In the latter years of his life, Uncle Jack Higgins spent most of his days reminiscing. Jack was a guest at all of the social functions which were given frequently in his later years by Dr. J. H. DePuy, one of the most prominent physicians of Wabash county. One of the dinner parties, most remembered and discussed, was his seventy-eighth birthday dinner, given Aug. 30, 1898, in his home at the corner of Maple and Miami streets. Later in the day, following the dinner, a picture of the 33 guests present, was taken, with all the members of the party seated on the porch of the Rome DePuy home. The photograph taken by E. E. Williams is today one of the most priceless in the possession of a few citizens in Wabash, and is one of the historic pieces in the county. A copy hangs in the Wabash County Museum today. Of the guests at the party that day the oldest was Albert Pawling, then 90 years old, and the youngest was R. P. Mitten, then 65. Col. J. H. Brunner, 74, an early pioneer of Wabash, a farmer who later went into the hardware business in Wabash, the firm being Bruner and King. After the Civil war, in which he won the title of Colonel, Mr. Bruner was employed as a carpenter, and served for a term as city marshal. Jack Higgins, 79, was a sailor, born in Liverpool, Eng., in 1818 he came to the United States and Wabash, one of the very earliest settlers here. He followed the trade of shoemaker, and took active part in the plasting of stone to make most of the streets of the city. He was engaged in many wars and kept at work until nearly a hundred years old. Many celebrations were given in Wabash as he grew older, and one of the largest of these was his 105 natal day, given at Wabash City park. During the last years of his life, Jack Higgins spent each day reminiscing and one of the most talked of events was the dinner party given by Dr. DePuy. Franklin Keyes, 86 was a native of New Hampshire, who came to Wabash after he had retired from active business. He lived in this city many hears, and his daughter, Anna Keyes was married to O. W. Conner of Wabash, coming from tow of the best known families of the county. David Coble, 82 was a farmer of Wabash county who lived his entire life here, and about whom little is known among those persons left who remember him. J. D. Conner, 79, was an early pioneer and a lawyer, whose practice continued for 60 years in the office now occupied by J. D. Conner jr. Mr. Conner was judge of the circuit court for a term. Jesse Talbert, 79 was a retired farmer, the father of W. O. Talbert of Wabash. Mr. W. Ross, 75 father of Wilson Ross, was a merchant in the early days of Wabash and was one of the original stockholders in the Citizens' bank here. He was an uncle to J. P. Ross, county clerk at present. J. H. Talmadge, 74, was a farmer of the county and was one of the stockholders and directors of the old First National bank. Cap. J. M. Thompson, 71 was a soldier in the Mexican and Civil wars, after which he was a member of the firm of Whiteside and McLese company, a drygoods store located where now Small's grocery is situated at the corner of Miami and Canal streets. He was later a postal clerk on the C. W. and M. railroad, now the Big Four. John Tyre, 70, was postmaster of the Wabash office for years. Philip Alber, 80 was a member of the Rettig and Alber brewers, the brewery being the stone building which is now the Wabash Packing company on Cass street. He was the father of Jacob, Frank and Will Alber. Michael Hyman, 81 was an early merchant of Wabash and was later associated with his brother in the firm of Leonard and Michael Hyman, manufacturers of linseed oil. Their plant was what is now the Honeywell plant on West Canal street. Michael Hyman was an uncle to Louis L. Hyman of Wabash. Robert P. Mitten, 65, father to Mark Mitten of Wabash, was for many years a carpenter and contractor here. Leven Murphy, 85, was for many years an employee in the Thomas F. Payne furniture plant, and was the father of Leven Murphy, who works in the barbershop at the corner of Market and Miami streets. Levi P. Dollison, 83, for years conducted a planing mill which was located on the rear of his lot on West Market street. His daughter lives in the old Dollinson home on Market street. Philip Davis, 79, was a well known farmer of Wabash county. Thomas F. Payne, an early settler of Wabash was first a cabinet maker here and later conducted one of the largest furniture manufacturing plants in the county. The plant was located where now the Honeywell plant No. 2 stands. Mr. Payne was a holder of considerable real estate and owned a large number of Wabash county farms. Dr. R. F. Blount, one of the best known men of the county during his entire lifetime, was a famous physician, who practiced medicine here following the Civil war, until 7 years ago, when his death occurred. He was the father of Frank Blount, and Mrs. M. R. Gardner of North Manchester. Dr. Blount was the physician in charge of the first trial transfusion of blood method in medical profession to be attempted in the middlewest. Calvin Cowgill, 79, was another early settler of Wabash. He was a farmer for years and then later served as county treasurer. He was also a leading lawyer of the county. His daughter is Mrs. Harvey Woods, and his son, Thomas C. Cowgill, both of Wabash. Dr. M. R. Crabill, 81, was another widely known physician of Wabash who practiced medicine in the county for years. W. H. DePuy, 70, followed the trade of carpenter and contractor for years until his death. His widow was killed two years ago in an automobile accident near Silver lake, and his daughter, Flora, died several months ago from injuries and complications of diseases, resulting from the accident. Cornelius Lumaree, 84, a native of New York state, born in 1814, came to Wabash following several years training at West Point. He was the father of George Lumaree, and followed the trade of carpentry here. Henry Wenzel, 73, was for years a farmer and gardner, who lived near Wabash, and who sold his garden products in the city. John Green, 70, was a well known farmer of the county. Levi Bruner, 75, who was the father of John Bruner, began as a farmer, and later changed his vocation to that of a manufacturer of wagon materials and accessories. Miles Morgan, 83, an early settler of Wabash was a gun-smith, a general mechanic, whose shop was located in a building which stood on the corner where the W. P. Jones store now is established. John Hoover, 83, was a farmer during all the active years of his life. Dr. James H. Ford was one of the first settlers in Wabash county, coming here in 1841. He served three years in the Civil war as surgeon in the Eighth Indiana regiment, and practiced his profession for years here. Dr. J. H. DePuy, 78, host at the party, began his practice of medicine at Lagro, called there when so much sickness of fever and ague sprang up, following the digging of the old Wabash-Erie canal. He was born in Pennsylvania in 1820 and settled in Wabash city in 1846, coming here from Lagro, when it was evident that Wabash would be the leading city of the county. Dr. DePuy was the father of Rome DePuy, West Maple street. Albert Pawling, 90, for whom Pawling street of Wabash was named was a millwright by trade, and one of the best known men of the county. He lived first at Niles, Mich., and came to North Manchester from there, later settling in this city, where he was a merchant. He was later president of the First National bank. Mrs. H. H. McNamee and Mrs. Fred Walter of Wabash are granddaughters. Thomas Underdown, 74, was born near London and came to the United States and Lagro, Wabash county in the early 60's. He had been a gardner in England, but gave up his trade here. He was county auditor and for ten years was bookkeeper at the King McNamee hardware store. He was the father of Tom Underdown of Wabash. Josiah Daugherty, 70, was first a farmer and then conducted one of the largest pork packing plants in the community. His plant was located just west of the city park. He was a merchant and was president of the First National bank here for years. Karl Daugherty of Wabash is a son. David Bach, 74, was for many years in the grocery business in Wabash, coming here from Germany. Transcribed by Mike Sweeney from the original newspaper furnished by Marjorie Priser.